It’s an Italian heritage choice with a modern sound. 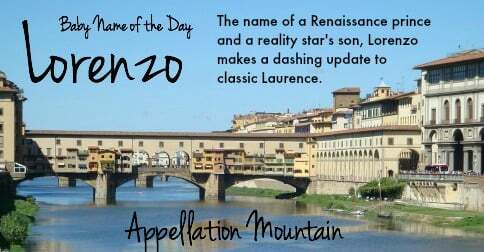 Thanks to Christina for suggesting Lorenzo as our Baby Name of the Day. Buttoned-down Laurence comes from the ancient world. The Roman family name Laurentius meant “from Laurentum.” The city took it’s name from the laurel. Back in the 200s, Saint Laurence was martyred in Rome, and his popularity helped the name spread throughout the Christian world. Other saints have shared the name over the centuries. 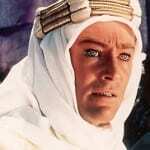 In English, Lawrence is the more popular spelling – though it was originally the surname form. International forms are many, including the dashing French Laurent and the Scandinavian short form Lars. Another diminutive, Larry, as wildly popular in the US in 1930s and 40s. But the Italian form is Lorenzo and it is, far and away, the most popular in the US today. Even if you only know a little European history, it’s easy to think of the most famous bearer of the name. Lorenzo de Medici was rich and powerful in Renaissance Florence – a de facto ruler of the city, though he held no formal office. He wasn’t the first of the gorgeously-named family. 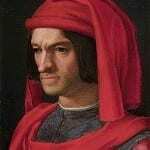 It was Lorenzo’s grandfather, Cosimo de Medici, who first became involved in Florentine politics as leader of the Medici Bank. And the bank itself had been founded even before Cosimo’s time. But it was Lorenzo’s patronage that made possible the works of Leonardo da Vinci and Michelangelo, to name just two. There were other men by the name in the era. In fact, Shakespeare gave the name to a character in The Merchant of Venice. The Bard’s Lorenzo marries Shylock’s daughter, Jessica. Enzo seems like a logical short form for Lorenzo, or other -enzo ending names, like Vincenzo. But it’s possible this name has entirely separate roots. There’s a similar old Germanic name, or it could be a form of Heinz. Heinz is all ketchup in the US, but in German, it’s a form of Henry. Enzo feels impeccably Italian today, thanks to famous bearers like Angiolini (shoes) and Ferrari (racing). And it’s a ready-made nickname for the longer Lorenzo. Early nineteenth century American preacher Lorenzo Dow wore the name. So did Latter Day Saints president Lorenzo Snow, from just a few decades later. Actor Lorenzo Lamas, a member of the Falcon Crest cast in the 1980s, and a reality star in more recent years. Lorenzo’s Oil, the celebrated 1992 film about a family’s search for a cure for their son’s rare disease. Susan Sarandon was Oscar nominated for her role as Michaela, Lorenzo’s mom. It’s based on a true story. More recently, Jersey Shore alum Nicole Polizzi – better known as Snooki – and husband Jionni LaValle welcomed a son named Lorenzo Dominic. Based on the numbers, Lorenzo is by far the most popular member of the Laurence family in use for boys today. Larry had fallen to a chilly #510 by 2014, while Lawrence hovered at #462. But Lorenzo is on the rise, up ten places to #227 in 2014. Some parents probably, like Snooki, chose the name to celebrate Italian roots. But the name also works well in Spanish, and, like Dante, has been embraced by parents who simply like the name’s modern sound. It’s a winning possibility today, a name following Leonardo and Mateo into wider use. Do you prefer Laurence, Lawrence, or Lorenzo?